Apparently they didn't fit, because they all flew away this afternoon. Mama and Papa are watching over them as they are learning to fly. It is so cool watching them stumble, then hop, then fly for 5 feet, then 10, then 20 feet. I hope the world is kind to my baby robins! We just returned home from a supremely marvelous time at the beach. I fed some fish and some ducks and got sunburned and saw Elvis. It was PERFECT. We had two uneventful flights home, and I was even upgraded to first class on one of them. Hubby wasn't. Oh well. We had a reasonably easy drive home from the airport, considering it was the Friday afternoon before Memorial Day in the metropolitan New York area. We had a fairly quick trip in and out of the Apple store to pick up my third iPhone in four months (speaker died on #1, touch screen died on #2). I do appreciate their "let's just hand you a new one for free" policy. All three accounted for, and Momma Robin was nearby with food. Then the trouble began. I tried to restore all of the information on my iPhone. Why does technology have to be such a booger? The phone had been backed up online, but nothing was restoring. Let's just say I was slightly frustrated. I already transferred my photos to my computer, so no big deal there. I have to re-install email programs, facebook (of course), and a few apps, but there was no way I could find all of my contacts. I decided that it wasn't fair that my husband was the only one who could share in my slight frustration, so I decided to call the nice folks at Apple. I am certain they would be happy to hear all about my concerns. While working my way through the phone menu and waiting on hold, I opened a few fun pieces of mail. I wish I were there, too. Seriously. It helped pass the time, but overall not too helpful, because my contacts still weren't restored. Eventually, I spoke with a wonderfully helpful woman from Apple who helped restore most of my contacts from someplace know as "the Cloud." I don't care if they came from "the Next Galaxy" as long as I have all of my cell phone numbers!!! In the middle of writing this post, my laptop gave the "Danger, Will Robinson" flashing light signal telling me my battery was dead. I was somewhat concerned since the laptop was plugged in to the outlet. After some investigation, we realized that the wall outlet was not working. The circuit breaker was off. We ran to the next room (laundry room) where the chest freezer is plugged in to the same circuit. We asked questions like, "How long has the freezer been off?" and "Do you smell anything awful yet?" Fortunately the food was still frozen and that particular crisis was averted. I still have to re-install some apps and hook up my email programs to get my iPhone working again. I'm finally able to show these! During my first (and only!) snow day last winter, I finished up some presents. Now that they've received their gifts, I wanted to show them to you. Do you like them? My toes, and the rest of me, are taking a much-needed holiday. Have a great weekend! Every year, Machine Quilter's Showcase in Overland Park, Kansas holds a quilt auction to raise money for the IMQA. You may have seen this quilt in progress. The applique process went smoothly not-so-smoothly nearly killed me. The quilting process presented a few challenges as well, but I persevered and am really pleased with the finished quilt! The scrunchy-bunchy part on top of the quilt is the hanging sleeve. I'm pleased that I got it sewn on at all and not too concerned that it isn't gorgeous. Done is good, right? The original design is inspired by my love of Eastern art. I was tickled to visit the Freer and Sackler galleries when I was in Washington, D.C. this spring and at least one touch in the background quilting of the appliqued circle was inspired by a statue of Queen Sembiyan Mahadevi as the Goddess Parvati. I used Daiwabo Japanese taupe fabrics from Pinwheels Trading Company. They are YUMMY! The hand appliqué and machine quilting were both done with InvisiFil 100-weight polyester thread from WonderFil. I quilted this on my new BFF, my Handi Quilter Sweet Sixteen. 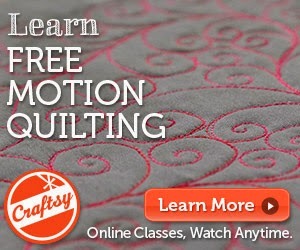 I never thought I would say this, but sit-down quilting ROCKS! If you ever want to be humbled, ask someone to hang your quilt next to Claudia Pfeil's quilt. No, I do not feel inadequate at all. Why do you ask? I did not see the geese actually bid on any quilts. They must have forgotten their wallets. The auction was a lot of fun, and a lot of money was raised for the IMQA. My quilt brought in $500, which is humbling but really cool too. A friend of mine has a very full and busy life and does not get to read often. She plans to have one day alone with a book, preferably a book that could be easily read in a day or two. I recommended Lottery by Patricia Wood. I read it a few years ago, loved it, remembered it and recommended it. Do you have any one-day reads to recommend? Today is a green, green day. I am hard at work in my studio this morning finishing the sample for Saturday's Longarm Quilting Club at the Quilt Basket. If you are free from 10-noon, check to see if there are still openings. Simple block, but just wait until it is quilted! She was yelling at me, but I was able to zoom in to get a photo of the nest. This drizzly week has brought out the most beautiful shades of green in all the plants and trees. It has also brought me some flowers! I have gazed out my windows long enough. Back to work! I was not satisfied with the grainy photo taken through a window and a screen yesterday, so today I tried to take the robin's nest photo from outside. The nest is about two feet from the front door and if I went outside Momma Robin would fly away so I slowly and quietly opened the door and stuck my arm out. I hid inside and took some photos without being able to see what I was taking. Poppa Robin was yelling at me from a nearby tree, so I pulled my arm back inside quickly. Photographing this nest makes me want to buy a better camera! UFO + orphan blocks = ??? In 2003 my guild invited Wendy Etzel to teach a workshop and speak at the guild. I know this because I bought her book and she signed it "Wendy Etzel, May 2003." I made a Log Cabin block that day, and added 8 borders (top/bottom, all around, and top/bottom again). This was all done from scrap and stash. The quilt now measures 58"x66". I think I might just add a simple brown border to finish this off. These are not colors I even use any more (no lime green!). I have no feelings toward this quilt, but I still think I should finish it. Any other suggestions? How would you quilt it? Does anyone even like this quilt? I am still dreaming of scrap quilts from the class I took with Bonnie Hunter last week. In her book "Adventures with Leaders and Enders," the quilt Rick Rack Nines is calling to me. My quilt will be 102" x 102"
I think Bonnie will be OK with these changes. Lately, my husband and I have been living in a movie. Specifically, "The Birds" by Alfred Hitchcock. My husband's office window opens to the front porch and that window has lately been under assault by a large, determined robin. The robin will sit on the porch railing, then fly to the window sill, then back to the railing. It will repeat this a few times before it tries to fly through the window. This has happened hundreds of times! We are still startled by the banging on the window. Fortunately the glass has held and is only very dirty instead of broken. When we go on the front porch to try and figure this out, the robin flies around, trying to chase us back inside. I have watched out the window while this robin has chased chipmunks through the yard as well. Yesterday, my husband found the nest. It is about a foot from my living room window and maybe three feet from my front door. We have discussed cutting down this ragged holly bush, but we are definitely leaving it for this year. I took the photo through the window and screen from a few feet inside the window. The photo is a bit blurry, but I didn't want to open the window and disturb them. So, what shall I do while I wait for babies? Should I work on some baby robin quilts? They should not take too long to make, being at most three inches square. I have a habit of buying fat quarters here and there, just because the fabric makes me happy. I had very little time to prep for this class so I simply pulled out my collection of "happy" fabrics, added some black and some white fabrics, and I was ready for class. So many more quilts I want to make now. I think every day is a great day in Quiltville, USA. Thanks for a great class Bonnie! In our family, we have a broad definition of the word "family." My son's wife's brother's baby? Family, and therefore received a quilt. My daughter's friend's sister's baby? Family, and therefore received a quilt.